Ooh-la-la! What have we here? 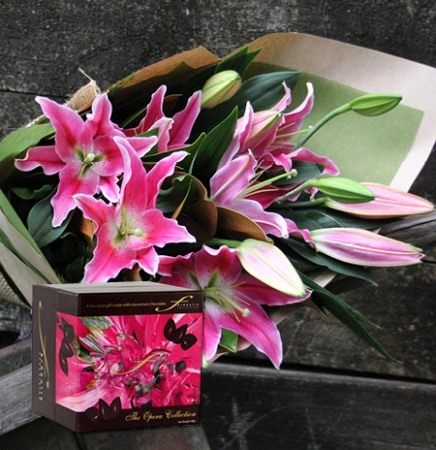 A luscious perfumed oriental lily bouquet for Easter in either pink or white, and a scrumptious box of assorted creme and truffle filled epicurean chocolates (100g). Our florist team will endeavour to include as many tight, yet-to-open buds as possible to ensure maximum longevity of these elegant flower stems. Love, love, love! Order your Easter flowers and chocolates via our online florist shop or call 1800 66 66 46.